MPEG2 ( Motion Picture Experts Group): has a variable video transfer rate of up to 10 megabits per second, and is also the format used for digital TV broadcasting. Essentially the core process behind DVD and the way in which the amount of data that needs to be stored on the disk is reduced, hence DVD’s dramatically increased capacity over previous digital disk formats. Put simply, the compression process has its foundation in the fact that film and video footage generally doesn’t alter much from frame to frame. What the compression process does is analyse the differences from one frame to the next and it is only those changes between the frames that are encoded rather than the repeated information. The first frame of a shot is referred to as an “I-Frame” and is basically a complete picture that is the updated with the relevant changes in detail. To avoid the moving image from deteriorating too much, new I-Frames are generally inserted every 15 frames or so (or whenever there is a shot change) – remember that PAL video runs at 25 frames per second and NTSC at 30fps. When Television started affecting Cinema attendances in 1950’s America, the big movie studios decided to try and lure audiences back by launching a variety of colour, sound and wide screen processes and presentations designed to make cinema-going as spectacular and literally big an experience as possible. Names such as Vistavision, Cinemascope and Panavision will be familiar to most. Although the technology behind each wide screen process differs the aim was the same – a bigger, wider image. Cinema were refitted with larger, wider screen to accommodate this new technology. Regardless of the size of the image projected onto a screen (or displayed on a TV) the aspect-ratio (i.e. the proportionality of the rectangular image) remains the same. The aspect-ratio of a feature film depends on how it was originally photographed. Up till around 1954, feature films with sound were Academy Frame with and aspect-ratio of 1.37:1 i.e. the projected image was 1.37 times wider than it was tall. This is pretty close to the proportions of a normal TV set, which has an aspect-ratio of 1.33:1 (in fact the American National Television Standards Committee adopted the basic Academy Frame ratio for television when it was introduced and simply rounded off the proportions to whole numbers i.e. 4:3). Vistavision had a ratio of 1.66:1 with both Cinemascope and Panavision being 2.35:1. The widest popular movie was “Ben Hur” (1959) with an aspect-ratio of 2.76:1. Most movies today are around 1.85:1 with some wider at 2.35:1 and very few narrower than 1.66:1. Note that the only film standard that is anywhere near the television shape is the Academy format; meaning that, before the advent of letterboxed VHS’s in the mid 80’s, practically every film after 1954 had to be “panned and scanned” to fit a standard television screen. Anamorphic lenses were first used back in the 50’s as part of certain wide screen techniques. Cameras were fitted with anamorphic lenses that squeezed a wide image onto a standard film frame. If projected normally, elements in this image would appear tall and skinny; but with the theatre’s projector fitted with the same kind of anamorphic lens then the filmed image is stretched or unsqueezed back to it’s true proportions as it’s projected. Films shot anamorphically include, for example, all of the “Star Wars” movies. As far as DVD is concerned anamorphic means something different but the notions of squeezing and stretching are good ones to keep in mind. When a letterboxed film is stored on DVD some capacity is wasted on storing the black bars above and below the image, capacity that could be better used contributing to picture detail. Anamorphic DVD’s can enable just that. Combined with a 16:9 wide screen TV anamorphic disks can effect a 33% improvement in picture quality. A 1.78:1 wide screen image is stored anamorphically by stretching it vertically by 33% thus using the entire vertical resolution of the TV screen. When viewed on a standard ratio 4:3 TV set the image appears tall and skinny, but when viewed in the correct mode on a 16:9 wide screen TV the hardware stretches the picture by 33% horizontally thus effecting a properly proportioned image and filling the screen. If the image in question is originally a 1.78:1 aspect-ration i.e. matches a wide screen 16:9 TV’s aspect-ratio then the image fits the whole screen perfectly. N.B. DVD players are designed to squeeze anamorphic images back down by 33% on standard 4:3 TV sets (they remove approx. every third horizontal line and add the black bars top and bottom). When wide screen images have a different aspect-ratio from that of the 16:9 TV then we encounter a problem due to the fact that the hardware can ONLY stretch anamorphic images by 33% horizontally. Therefore any wide screen images that are wider in proportion than a 16:9 screen will need to have some form of letterboxing at the top and bottom of the image. This then unavoidably wastes some storage capacity on the disk and fails to utilise all of the screen’s vertical resolution. Some wider images have been known to be side cropped to get closer to 16:9 proportions. Previously known as AC-3 this is Dolby’s digitally compressed multi-channel audio system. At peak performance the process can offer, through a Dolby Digital decoder, a 6 channel soundtrack consisting of 5 channels of surround sound – left, right, centre, right-rear and left-rear PLUS a dedicated low frequency effects channel routed to a subwoofer for bass ranges. 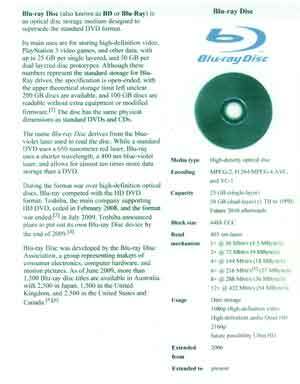 Blu-ray Disc (also known as BD or Blu-Ray) is an optical disc storage medium designed to supercede the standard DVD format. Click on the image below for an overview of this format (opens in new window).